In my garden, August is for fragrance. An accident of timing? Perhaps. But I'll take credit for the honey scent of sweet alyssum, started from seed some time in May and by happenstance from last year's crop. If you have enough of it growing in a relatively small area, you can smell it as it rises with the heat of the day. If you grow sweet alyssum (Lobularia maritima) from seed, you will most likely have its seedlings the following year. 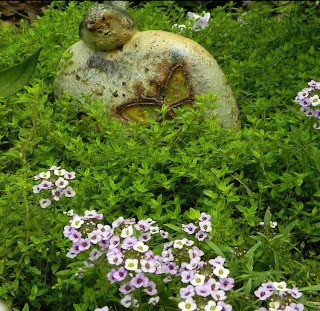 I grew a variety by Renee's Garden Seeds called "Summer Romance" last year and have pale pink and white seedlings surrounding a little bed of thyme. I had some seed left this year and started it in a pot along with some Polianthes tuberosa and Agapanthus. In July I look longingly at my Phlox plants, craving the scent that, in addition to peonies, reminds me of my Grandma Martha. She grew the self-seeded version, which smelled as sweet but were garden gifts instead of hybrids. I don't let mine go to seed; I don't have the room, really. Three varieties ad their distinctive fragrance throughout the garden: 'Sandringham', 'David's Lavender' and 'Blushing Shortwood'. In all the years I've been growing a variety called 'Sandringham', it hasn't had a spec of mildew. This variety looks a lot like the old-fashioned 'Bright Eyes', and it might have been mislabeled when I bought it at a local nursery 20 years ago. 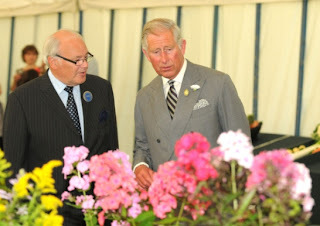 I've come to learn that 'Sandringham' was likely named for a place and a garden show in Britain (see photo of Prince Charles scrutinizing what looks like phlox). 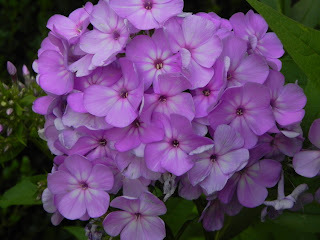 Phlox 'Sandringham' blooms in my August garden. Luckily for us and our noses, Phlox paniculata seems to be a plant whose scent can't be hybridized out of it. Just as fragrant as the old-fashioned 'Sandringham' is the fairly recent introduction 'Blushing Shortwood', an adorable bi-color that's hard to capture in a photo. 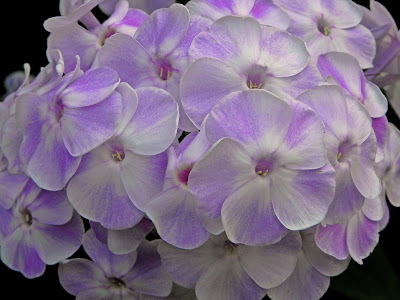 Its flowers are white with smudges of pinkish-lavender. It grows to around three and a half feet in my garden and doesn't need to be staked. I used to grow 'David' but now have 'David's Lavender', a stunner that goes nicely with anything purple, such as Clematis 'Rooguchi'. And I'm not sure where I'd be without my orange jessamin, the common name for Murraya paniculata. Because of its generosity of bloom, my patio smells just like a citrus field. I can't say enough good things about this plant's ability to live indoors without many ill effects and then be acclimated to live outdoors in the summer. Murraya paniculata in bud and flower.